Two On Two Off: KwikSew 3854 and Jalie 2805 for the WIN! KwikSew 3854 and Jalie 2805 for the WIN! Isn't the sailor short cute? I've never sewn anything with this sort of button closure on it. This is one of the patterns I bought for $0.10 at my local fabric store. I made the medium but I could have probably made the small. My hip measurements are right between the two sizes, but since KwikSew tends to be larger on me, I should go with the smaller size. Here it is in a dark denim. 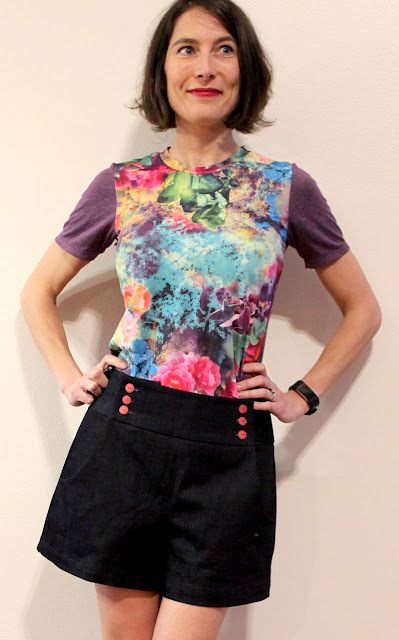 This is a remnant from a pair of Eleonore jeans I made. I really like how it fits. The legs are so wide, it looks more like a skirt than a pair of shorts. The top is Jalie 2805 also made out of remnants. 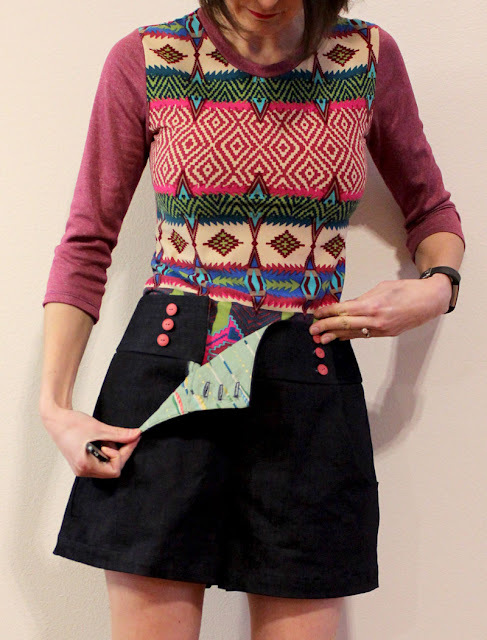 This is one of my favorite Jalie patterns EVER. So many options. This is the second Jalie top I made for these shorts. This is also out of remnants. I always feel good when I can use things up. This is a Girl Charlee knit. 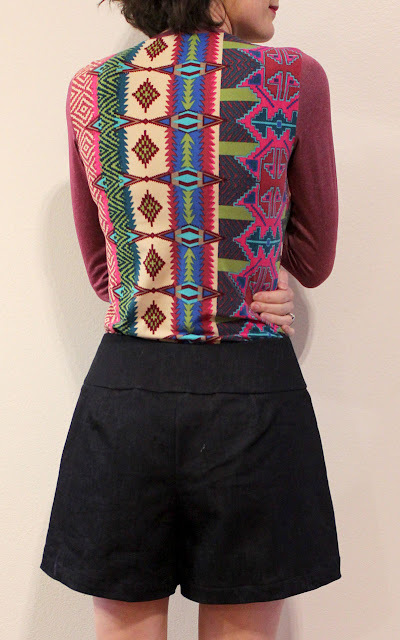 Since it was a remnant, I didn't have enough for the sleeves or the back. So I had to get creative. I put the back on the cross grain but it works with this fabric because it is pretty stretchy both ways. 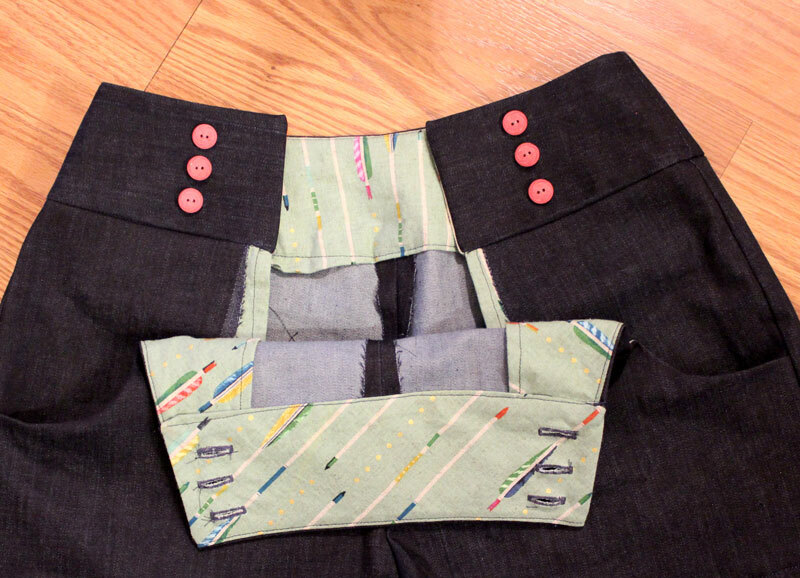 The back of the shorts has two shaping darts and a wide waistband. First, I put on the cutest red, white, and blue buttons. But, because they are probably 20 years old and plastic, two of them broke after I put them on. Dammit. So then I went with the pink buttons. I didn't have enough fabric for the entire pocket so I just made a lining piece and added a small piece of the denim to the top. The construction of these shorts is pretty cool I think. This whole bib-flap-thing folds down which kind of makes for unusable pockets. But the pockets are a cute addition, right? 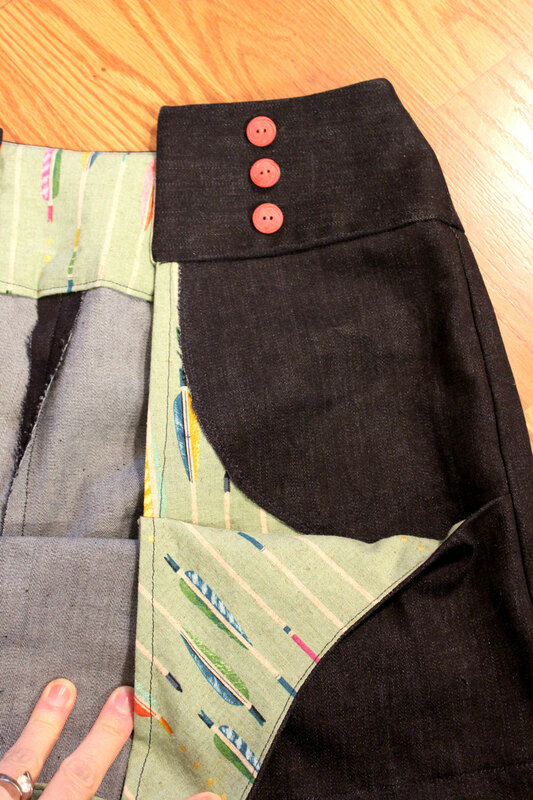 Have I told you how much I love my new sewing machine with the perfect buttonholes?? I made a pretty large swayback adjustment on these. I think the total was one inch over three different places. 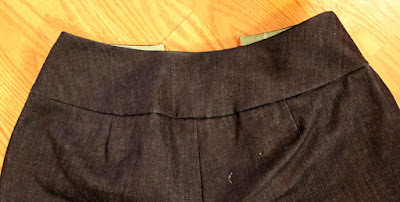 But this waistband was on the fold so it would be two inches total. Over all, it's a win! I've been vacation sewing the past few days because we head to San Diego again in a few weeks. I have another thing to show you too.